I saw my first earthen oven in Santa Cruz, California, where I was studying Agroecology. The fellow student who built it had a small bread business selling bread that he baked in it. My studies in Santa Cruz led to an internship on a biodynamic farm in Austria and there I got to know whole-grain sourdough bread and learned to bake it. 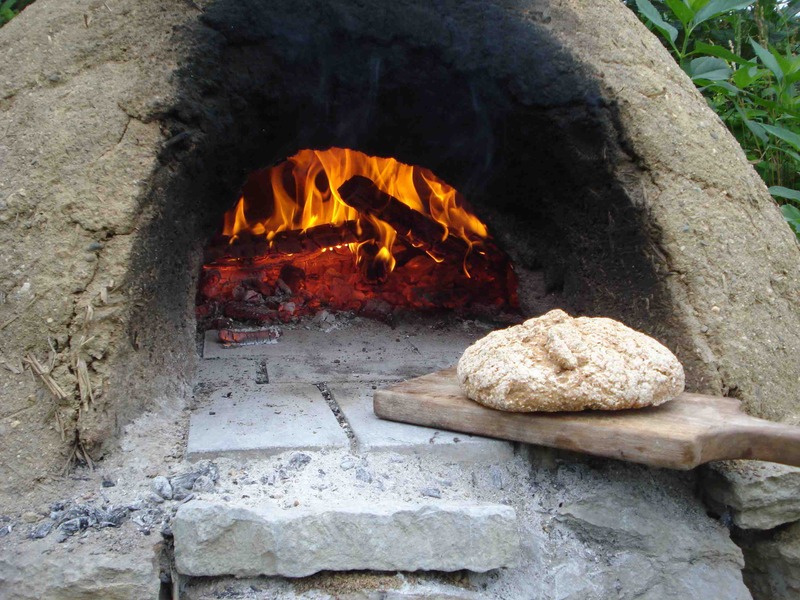 I eventually learned that this bread was best out of a wood-fired oven but since I had never built anything in my life at that point, I couldn’t imagine affording or building a brick oven myself. Then I happened upon Kikoâ€™s book and it quickly became clear that this was something I could do myself! At that point I was in Iowa with my wife Andrea, who is from Linz, Austria (we met at the farm where Iâ€™d interned). 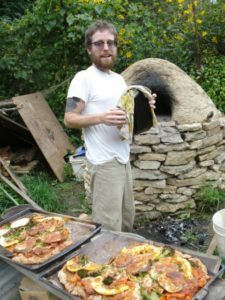 We started telling people about our dreams: to build an oven, grow grains by hand (I’m a passionate scythe mower and even trained with the Austrian Scythe Association), baking Austrian-style bread and selling it at farmers market to make a meager living. 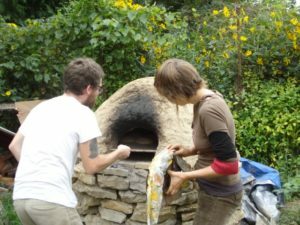 An older homesteading couple said they’d like to see that happen at their place, so we moved there and built our first oven, which took us a month. There was a lot of rain and flooding that year, so I used sand that the floods left behind and gravel that washed off the roads into the ditch. I built the foundation out of limestone that crumbled off of roadside outcroppings. This 32.5â€ oven cost about 50 dollars, the only expense being the firebrick. We quickly started making test batches of bread and just giving it away. 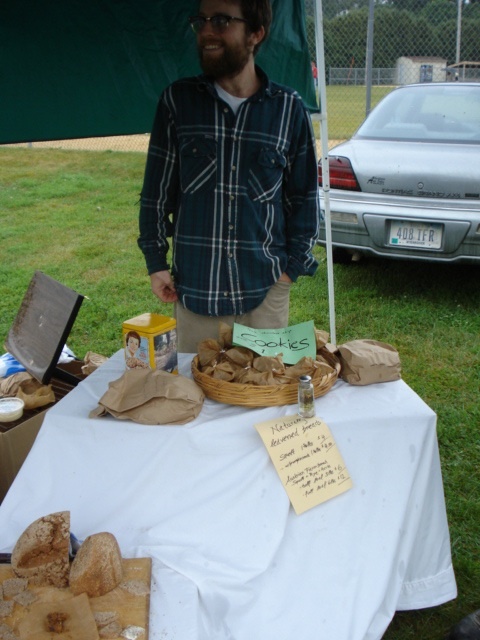 When we were confident that we could reliably make good bread, we opened our stand. This was the last open question: would Americans in a small town in Iowa want to buy our bread, the likes of which they’d probably never seen before? Well, the first week we sold out and eventually we almost couldn’t bake enough bread to meet demand. The most we ever baked on baking day was 50 1.5 pound loaves on three bakes with one firing. The first load was done in 20 minutes, the second in 45, the third in a little over an hour. They sold out at 5 bucks a pop. I’ve now built about ten ovens, four of which were built in workshops that I gave. Together with my wife I’ve also built a balecob cabin for ourselves and I’ve worked on several other earthen buildings. Andrea’s also built a small cob rocket cooker, a cob bench and a straw/cob sweatlodge. A few short years ago, we had never built anything, but through Kiko’s book, we realized that anything was possible with natural materials. 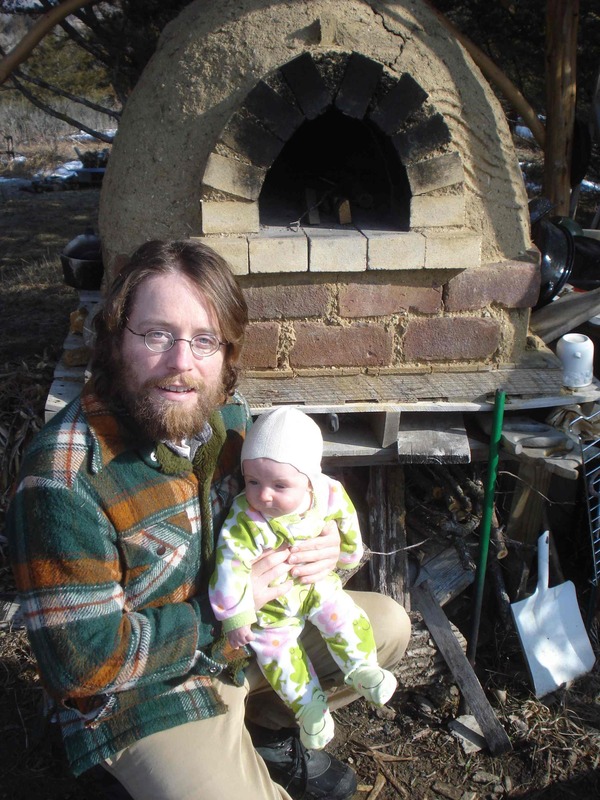 Reading Build Your Own Earth Oven took my life in a new direction and even pointed the way towards a new way of nourishing my body that has helped me overcome chronic digestive problems. My point here is not to brag, but rather to tell you what has been made possible to me through this book and will hopefully be possible for you too. This book changed my life and it is an honor and a pleasure to be able to offer it to the German-speaking world.